Everything seems clear as daylight to Major Steve Arnold as he lounges in his office in a bombed-out Berlin ruin. He is investigating the guilt or otherwise of Dr Wilhelm Furtwängler, who conducted the Berlin Philharmonic orchestra during Hitler’s Third Reich. It’s all a build-up to the confrontation in Taking Sides between Arnold (David Horovitch) and his quarry, Furtwängler (Michael Pennington). Ronald Harwood wants to present the “agonising personal and moral choices that had to be faced by the protagonists”. Harwood is perhaps best known for the film of his play The Dresser which starred Albert Finney and Tom Courtney, and his screenplay of Roman Polanski’s The Pianist. Taking Sides brings out the realities of what people faced under the Nazis and how they reacted to dictatorship in a relentless way, highlighting the complexities and knife-edged nature of historic change itself. Harwood drives home his points by turning what could be our “natural sympathies” upside down. Shouldn’t we dislike, even despise Furtwängler, whose elevated status – he was on the Nazi’s Gottbegnadeten list (Important Artist Exempt List) – gave him choices denied to others in Nazi Germany? And yet, and yet. By craftily making Major Arnold a vulgar insurance claims assessor with no appreciation of culture, let alone German classical music or its role in people’s lives, Harwood arouses sympathy for the now aging and out of work conductor. We begin to see Furtwängler as a victim of “victors’ justice” rather than someone who kept his high status under the Nazi dictatorship. When Arnold drags personal details about the conductor’s love affairs out of the secret files gathered by Nazi Party official Hans Hinkel, your hackles start to rise. What is the difference between American “justice” and the methods of their opponents? And why is Furtwängler being given such a hard time when others like scientist Werner von Braun, who helped develop the V1 and V2 rockets, were given immunity and whisked to the US to help with its space programme? Establishing guilt and the reality of Furtwängler’s position grows more perplexing as we learn that he helped many Jewish musicians escape Nazi Germany. And, we begin to understand the extraordinary veneration which music lovers had for a man whose formidable technique made some see him as the greatest conductor ever. 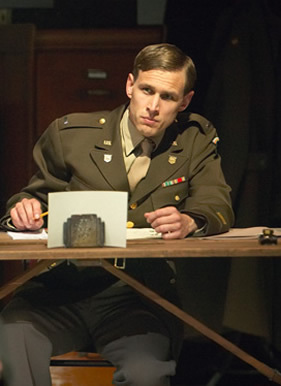 Harwood reveals this through the characters of young Jewish-American Lieutenant David Wills (touchingly played by Martin Hutson), Arnold’s nervy typist Emmi Straube (Sophie Roberts) and the distracted Jewish musician’s wife Tamara Sachs (Melanie Jessop). The balance of culpability tilts this way and that – but in the end, as Harwood notes, unpleasant as Arnold is, “he is the only one in the play who mentions the dead; all the others talk about is art and music”. It was the late great Harold Pinter who first directed Taking Sides back in 1995. By all accounts, that staging at London’s Minerva Studio Theatre was mesmerising. István Szabó directed an atmospheric and probing film version in 2001. In this less sentimental and more hard-hitting production under director Philip Franks, emotions run high and the characters are sharply defined, each enmeshed in his or her particular dilemma. Beethoven and Mahler recordings are used to shut out Major Arnold in an unnerving way. A line in the closing scene – “only tyrannies can understand the power of art” – makes you sit up and think yet again. 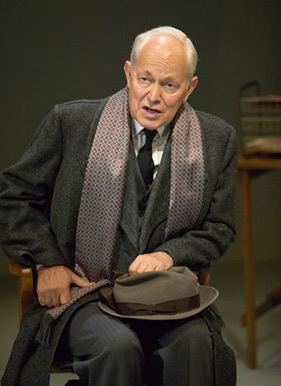 All praise to Chichester Festival Theatre and the London producers for setting the two plays side by side and setting out disturbing truths about art and the difference that an individual can make under authoritarian rule – past and present. 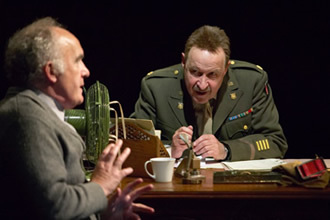 Taking Sides is part of a double bill alongside Ronald Harwood’s new play, Collaboration. They run at the Duchess Theatre, Covent Garden until 22 August. Special offers are available for both shows.